Inorganic fertilizers are also known as synthetic or artificial fertilizers. These kinds of fertilizers are manufactured. Inorganic fertilizers do not need a certain time to be broken down or decomposed before usage because these contain nutrients that can be readily absorbed by plants. Inorganic fertilizers are usually given as a “rescue treatment” to plants that are malnourished, unhealthy or even dying. Inorganic fertilizers are appropriate in this situation because the nutrients needed by the plants are readily available. In comparison, using an organic fertilizer would mean that the plant has to wait until the components of the organic fertilizer have been broken down first into its primary nutrients. By then, the plant could be dead already. Inorganic fertilizers are designed to give plants all the nutrients-Nitrogen, Phosphorous and Potassium that they need in appropriate proportions and amounts. Hence, plants do not get more of one can of nutrient over the other. Instead it has a balance of all the nutrients it needs and are readily available at a given time. Adding inorganic fertilizers into the soil to be planted makes the soil ideal for planting as it is already enriched with nutrients. You do not have to spend much on buying an inorganic fertilizer because it is relatively cheap. Of course, it is not as cost-effective when compared to using compost. Yet, for the convenience that it gives you when it comes to caring for your plants, an inorganic fertilizer is a very good deal already. It takes awhile to make your own organic fertilizer. Though the process is relatively easy to do, still you need to delegate enough time to do the task and wait for the decomposition part to take place. It takes awhile. With an inorganic fertilizer, you save a lot of time and effort. 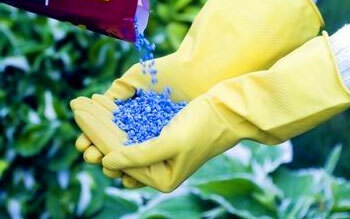 Inorganic fertilizers are quite cheap and even easier to use and prepare. They are available at almost every gardening store. Inorganic fertilizers contain nutrients that have been broken down already into the most basic of its components for easy absorption by the plants. Yet, it can also be washed away easily when watering or irrigating the plants. This is called leeching. Leeching happens very often as you water your plants. Hence, a lot of the fertilizer goes to waste. Nitrogen is one of the elements that easily get washed away since it usually settles below the roots of the plants quickly.This is called leeching, and it happens very often. When you’re using inorganic fertilizers you need to pay special attention to the roots of the plant when you’re watering it and not over water the area so that you’re not encouraging the leeching of the nutrients in the soil. Generally, inorganic fertilizers are inexpensive. Yet, some specially formulated inorganic fertilizers come at a cost that are considerably higher than most. Inorganic fertilizers are not entirely composed of the nutrients needed by the plants. It also contains salts and other compounds. These are not absorbed by the plants so they are left behind in the soil and build up over time. When found in large amounts in the soils, these compounds can alter the chemistry of the soil that makes it less ideal for planting. Often times, the soil needs to be neutralized using other substances to return it to a normal state that is suitable for planting. Furthermore, these toxic compounds may also get washed away when you water your plants and seep into groundwater. It has been reported that the toxic wastes from fertilizers contaminating the water we drink is bad for the health. Fertilizers are good sources of nutrients for plants. However, too much of it can also be harmful to the plants. Applying the fertilizer directly to the plants may burn the delicate plant structures such as the roots. This could affect the over-all development of the plant. Inorganic fertilizers have both good and bad points. Should you consider using them, better maximize and the advantages and try to prevent all its avoidable disadvantages.